Here’s a letter, dated Feb. 5th, from Jean Dresden. 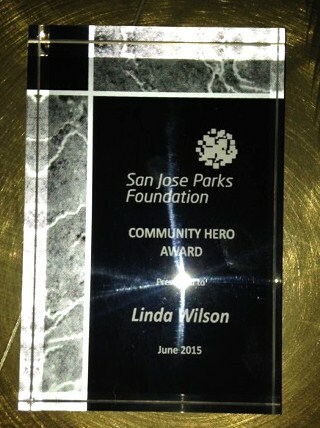 Jean is a member of the San Jose Park Advocates group (an all volunteer group of neighborhood association leaders). 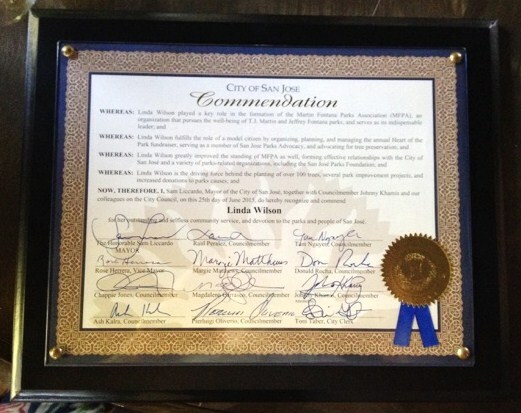 This letter was presented to the San Jose City Council Neighborhood Services & Education, (NSE), committee. 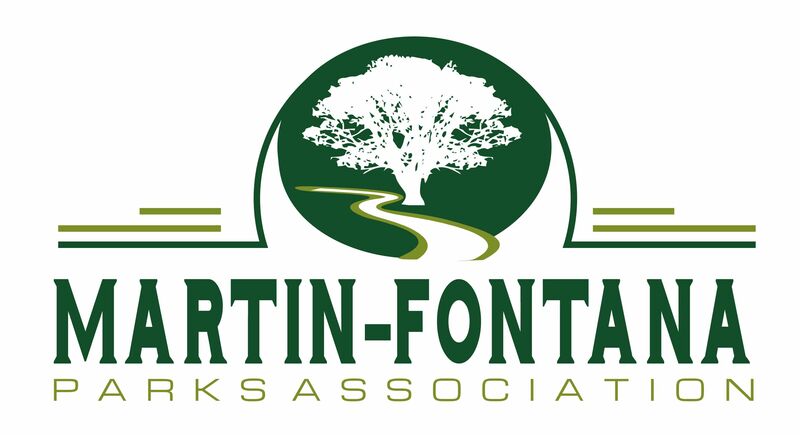 In It you will find a good summary of current San Jose park issues. Here’s a link to read the letter: parkconditionsnse2017feb9item3sjparksadvocates. 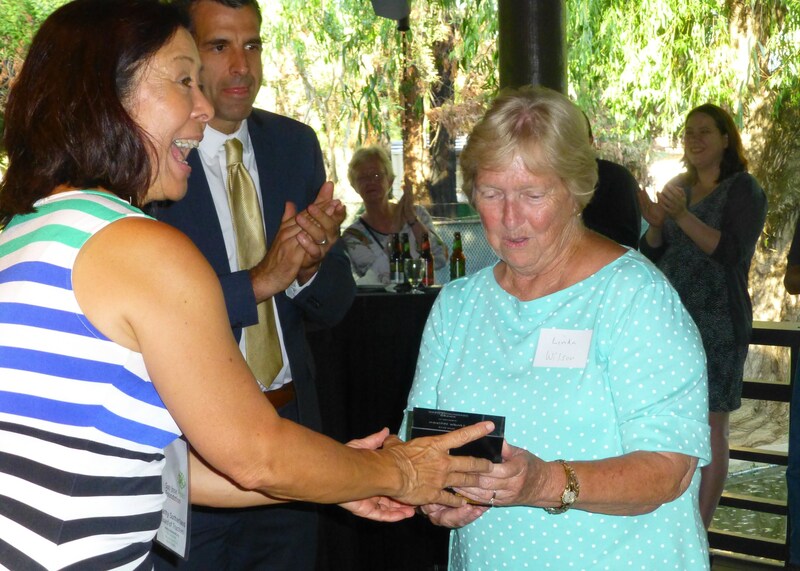 Thursday June 25th, at the Japanese Friendship Gardens Tea House, San Jose Parks Foundation’s President, Kathy Sutherland, presented their Community Hero Award to MFPA President Linda Wilson. 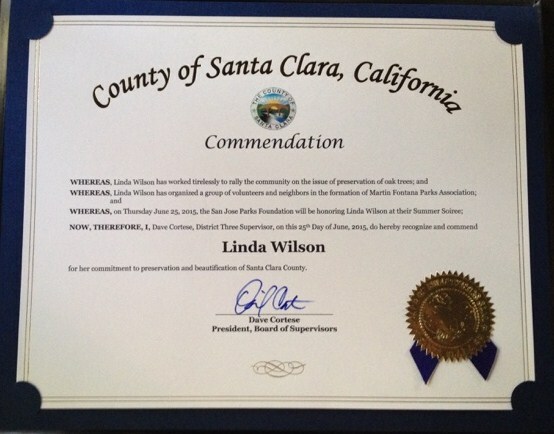 Linda also received a Commendation from the County of Santa Clara presented by Policy Assistant, Mike Donohoe. 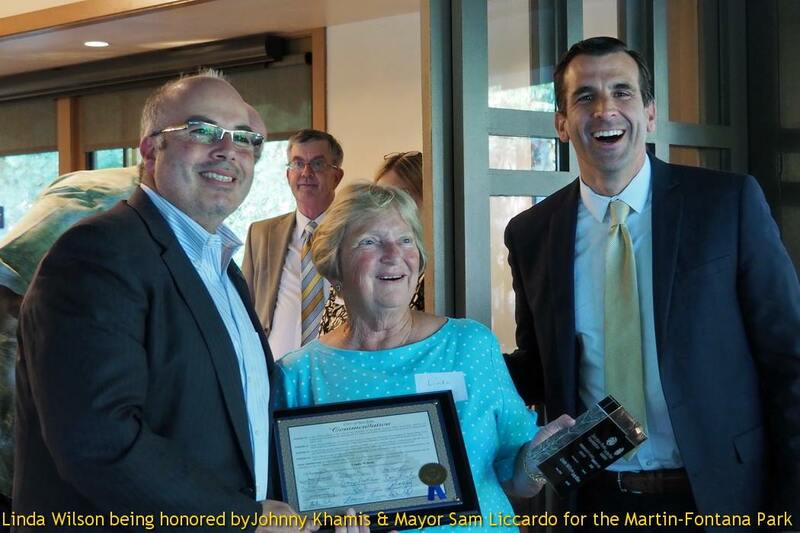 Presenting the final Commendation from the City of San Jose were District 10 Councilmember Johnny Khamis and San Jose Mayor Sam Liccardo. A beautiful evening was enjoyed by all in celebrating the partnerships, projects, and the future of the San Jose Parks Foundation. A big thank you to James Reber, the Founding Executive Director, for putting this all together. 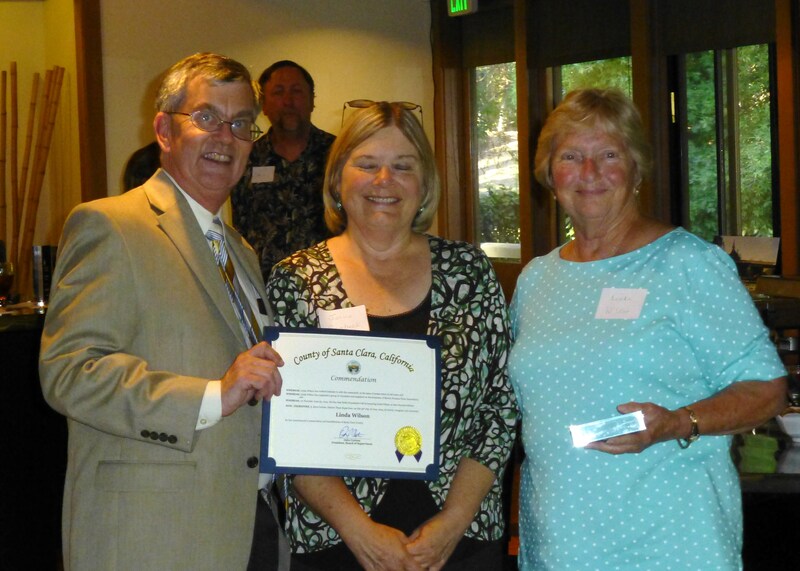 Per Councilmember Nancy Pyle’s latest newsletter, everyone is invited to an Open House style Community Thank You Celebration at the Almaden Community Center from 5:00 p.m. to 7:00 p.m. on Thursday, December 13th with a more formal ceremony beginning at 5:45pm. 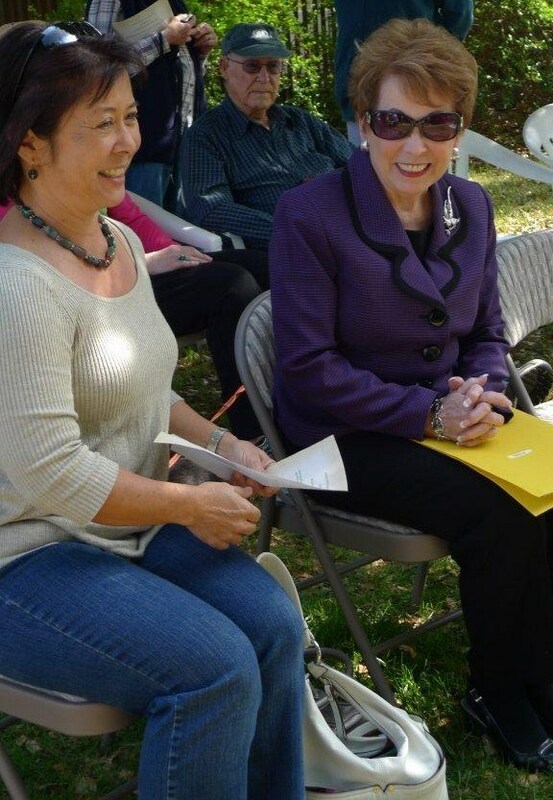 We will serve hors d’oeuvres and enjoy musical selections from the San Jose Youth Symphony. 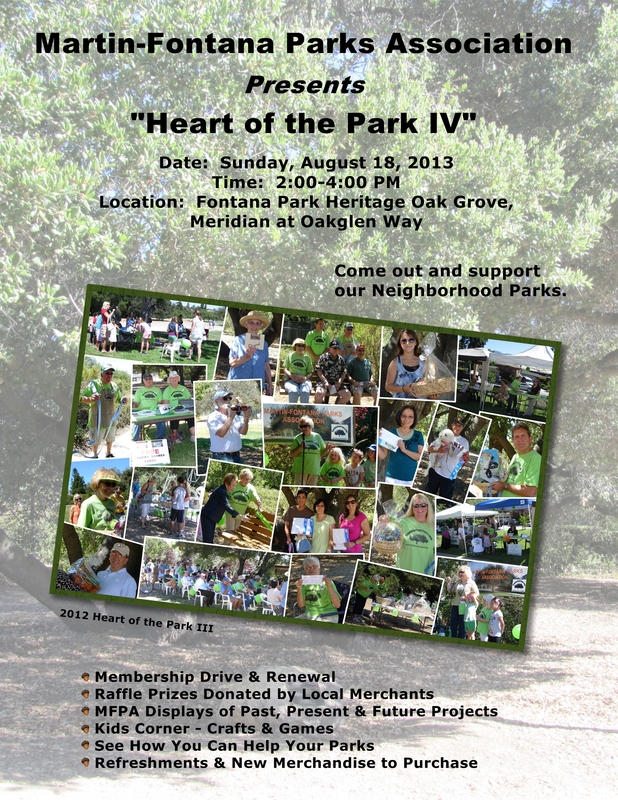 If you are able to attend, please RSVP to laura.cowan@sanjoseca.gov or call 408-535-4979 for more information.